If you spend any time at all on the beaches of Goleta, you know what tar is. Some days it’s plentiful other days, there isn’t any. Surprisingly, a lot of people don’t understand why it’s there. Lots of folks assume it’s due to the big oil rigs out in the channel, leaking excess oil. 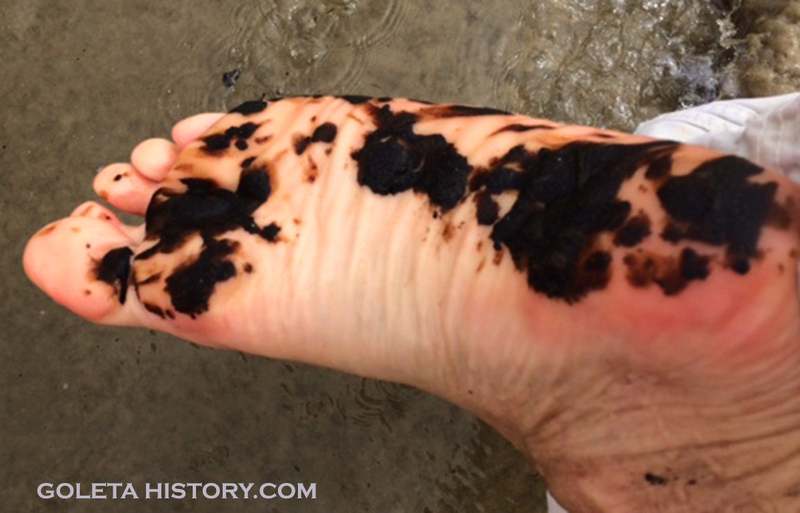 But the reality is, tar has been on our beaches for a thousands of years and archaeologists have found signs of human use of tar and oil. Chumash Native Americans began building plank canoes called “tomol” and caulked them with boiled tar and pine pitch around 500 AD. Soon they began preparing tar as a traded commodity. Woven water bottles were caulked with tar to make them waterproof. Women wadded up tar and used it as weights to hold down the bottoms of their grass skirts. Tar was used as a coating for sewing strings and fishing spears and in the construction of pipes and whistles. It was also used to cement fractures in broken bowls and vessels. You can see a good example of a tomol at the Santa Barbara museum of natural history. On Oct. 16, 1542, Juan Rodriguez Cabrillo sailed into the Santa Barbara Channel and noted that the natives were using the asphaltum as canoe caulk. He used some of the tar to caulk his own ships. In 1792, Captain Cook’s famous navigator, George Vancouver, reported that the ocean near Goleta was covered with an oily surface in all directions. According to Vancouver, the oil was so thick that the entire sea took on an iridescent hue. Many other explorers reported similar sightings. Drilling for oil didn’t start until 1928 when the Barnsdall and Rio Grande oil companies discovered the Ellwood Oil Field. The oil was produced from piers that were built on Ellwood Beach. Oil tanks that were constructed in 1929 to store the Ellwood oil are still in use west of the UCSB campus. While the Ellwood Oil Field was discovered in the late 1920s, it wasn’t until the mid-1940s that scientists began studying the intense offshore oil and gas seepage zone near Goleta. Spanning an area three miles long and one mile wide, the seep exhibits all the characteristics usually associated with a major underground oil deposit. Numerous oil and gas seeps are located along the entire coast of Santa Barbara County and Northern Ventura County. 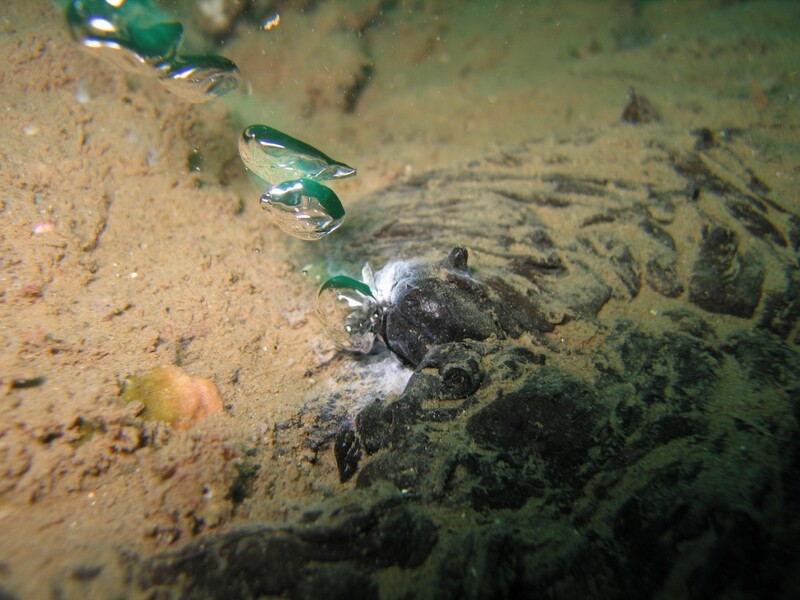 There have been more than 1,200 natural seeps charted in the Santa Barbara Channel. Half of these occur within three miles of Coal Oil Point. The seeps produce a persistent oil slick that’s usually carried north and west by ocean currents. As the oil rises to the surface and floats, it coagulates and biodegrades into tar. The most heavily impacted beaches are those between Campus Point and El Capitan Beach, although wind and currents sometimes take the oil slick onto Santa Barbara city beaches and as far away as Los Angeles. The amount of tar that ends up on the beach also depends on wave activity, since high surf conditions tend to break up the oil slick and prevent it from reaching the beaches. Thus more tar in the summer, when we have fewer waves and more feet on the beach! Probably the reason most folks are quick to blame the oil rigs for the tar is due to the Santa Barbara oil spill of 1969. It was the largest oil spill in United States waters at the time. The source of the spill was a blow-out on January 28, 1969, six miles from the coast on Union Oil’s Platform A. Within a ten-day period, an estimated 100,000 barrels of crude oil spilled into the Channel and onto the beaches of Santa Barbara County, fouling the coastline from Goleta to Ventura as well as the northern shores of the Channel Islands. The spill had a significant impact on marine life in the Channel, killing thousands of sea birds, as well as dolphins, elephant seals, and sea lions. Since the spill happened in the middle of the surf season, lots of surfers got intimate with the muck. The cleanup lasted for over a year and the residents grew to despise the sight and smell of tar. The public outrage caused by the spill resulted in environmental legislation being passed within the next several years, and the birth of the modern environmental movement. So that’s why we got tar on our beach. And why folks blame the oil companies. Humans have been finding ways to utilize the oil oozing out of the earth for eons. Tar. It’s not hard to get off your feet, and it’s a small price to pay for the pleasure of enjoying some of the most beautiful beaches in the world.